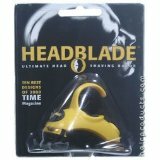 HeadBlade is made especially for use in shaving the scalp. 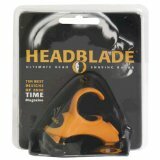 Numerous brands of blades are compatible with the HeadBlade including Schick, Gillette, Noxzema, and Old Spice. You can also use this as a regular shaving razor. These refills give a very smooth headshave with the micro Tilted Grinding system which is coated with micro thin film. 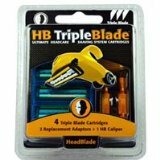 The HB Triple has been calibrated specifically for these blades. 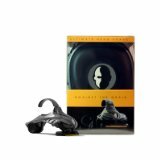 This package contains 1 blade and a HeadBlade Unit for the Ultimate Head Shaving Razor. You can use blade cartridges including the Super II®, Schick® Ultrex®, and the Gillette® Atra®. HeadBlade S4 Shadow Stainless Steel Limited Edition Razor is constructed with the highest quality. It is constructed with stainless steel and has blacked out wheels. Included with the S4 is an extra blade, HeadSlick sample, and a travel case. You also get an extra adaptor for Gillette and Schick standard razor blades. 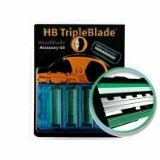 HB Triple is the newest blade by HeadBlade. Made to give the smoothest headshave that is possible. The kit includes the caliper for removing the blades out of the tray easily, and 3 adaptors. You can use any model of HeadBlade with these new blades.